Inexpensive 50 hp soft starter, 37 kW three phase 230v, 380v, 460v, 690v for selection, protect AC induction motor from inrush current impact, buy from Chinese manufacturer directly. 50 hp AC motor soft starter, 37 kW three phase 230v, 380v, 460v, 690v for selection. Model GS2-037 (230v), GS3-037 (380v), GS4-037 (460v), GS6-037 (690v). Starting Times It is recommended not to exceed 20 times per hour. Control Mode (1) Operation panel control. (2) Operation panel + external control. (3) External control. (4) External control + COM control. (5) Operation panel + external + COM control. (6) Operation panel + COM control. (7) COM control. (8) No start or stop operation. Start Mode (1) Current-limiting to start. (2) Voltage ramp to start. (3) Torque control + current-limiting to start. (4) Torque control + voltage ramp to start. (5) Current ramp to start. (6) Voltage current-limiting double closed-loop start. Stop Mode (1) Soft stop. (2) Free stop. Protective Function (1) Open loop protection for external instantaneous stop terminals. (2) Over-heat protection for soft starter. (3) Protection for too long starting time. (4) Input open phase protection. (5) Output open phase protection. (6) Unbalanced three-phase protection. (7) Starting over current protection. (8) Running overload protection. (9) Under voltage protection for power voltage. (10) Overvoltage protection for power voltage. (11) Protection for fault parameter setting of the soft starter. (12) Load short circuit protection. (13) Auto restart or incorrect wiring protection. (14) Incorrect wiring protection of external control stop terminals. Ambient Place to be used Indoor location with good ventilation free from corrosive gas and conductive dust. Altitude Below 1000M. It has to increase the soft starter rate power when the altitude is more than 1000M. Humidity 90%RH without dew condensation. Soft starter is used to decrease the starting current of the induction motor and decrease the tensions. However, variable frequency drive (VFD) is utilized when you have to control the speed, torque... of the induction motor during a process. Generally, when we use a soft starter to accelerate an induction motor to its operating speed (97% synchronous speed), then we by-pass the soft starter. The motor normal operation is same as cross-the-line operation. 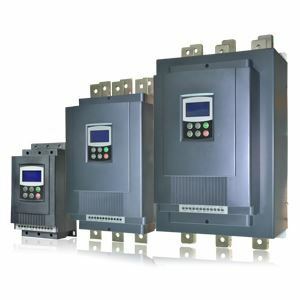 Generally VFD is used continuously to change speed, whereas soft starters are only for reducing starting surges, so as a whole VFD fulfills both purposes during starting as well as normal running if budget is not concerned. Please'd like to know the time of delivery of this equipment.